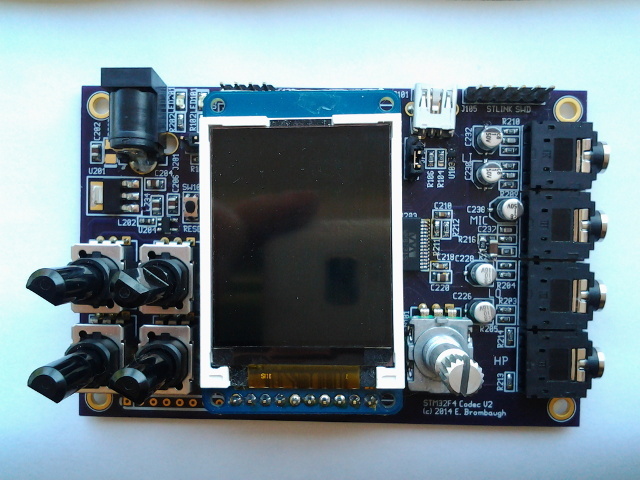 This is a small (3.7" x 2.4") board with an STM32F405RGT6 MCU, a Wolfson WM8731 codec and a variety of I/O resources to support development of embedded audio effects applications. This is a revision of the the STM32F4 Codec board. Note: Footprint is compatible with other 64-pin QFP parts in the STM32F405/7 family for additional resources. JP101: STM32 Boot mode jumper. Install to run bootloader. JP102: USB VBUS selector. Choose bus power, self power or OTG. J201: Power: 4-pin keyed power connector (+5V only). J101: USB. Mini-AB connector for USB device/host. J105: ST-Link SWD. 6-pin in-system programming connector. J106: 8-pin 0.1" header to unused GPIO on MCU. CONN201: 3.5mm stereo line-level audio output. CONN202: 3.5mm stereo line-level audio input. SW101: Reset button - tied directly to the MCU reset input. Handy way to quickly reboot your MCU after flashing new code into it. LED201: Power indicator - lights up when 3.3V is present. LED101: User GPIO - connected to GPIOB-8,9. Useful for diagnostics. VR101,VR102, VR103, VR104: 10K ratiometric pot inputs to 2 ADC input channels. STM32F4 Discovery: for downloading and debug via SWD port. Open OCD Open-source interface for downloading and debugging via ST-Link. STM32F34xx DSP and Standard Peripheral Libraries: Manufacturer's low-level C driver code. 2014-05-30: PC boards received from fab. Codec Line in/out, LCD, ADC, Serial, Encoder works. Mic input requires minor wiring fix but works. Power Jack footprint needs corrections, but usable. USB DFU Bootloader not enumerating. 2014-06-10: USB MIDI device works. 2014-06-30: USB MIDI host works. 2014-07-02: Fix Xtal caps - USB DFU Bootloader works. 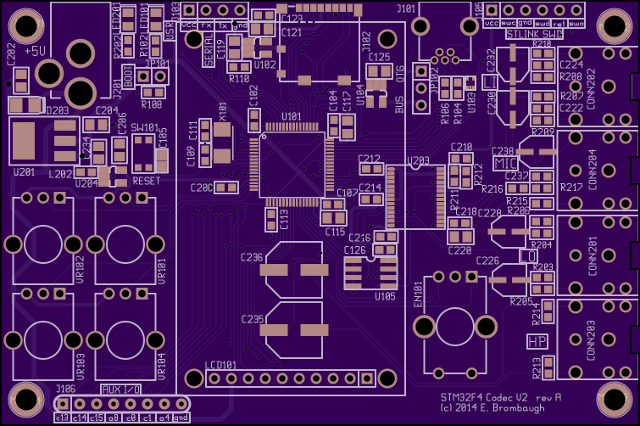 2014-07-03: Update schematic, layout, order Rev A boards. 2014-07-18: Rev A boards back from fab. Tested and all features working. 2017-08-04: Board shared at OSHpark.